The 6500 species of largely fresh-water fish belonging to this superorder occur throughout the world except for Australia; catfish are the only Australian members. Loaches, roaches, carp and catfish are united as a superorder by the presence of alarm substances to warn others of danger and possession of the Weberian mechanism for transmitting sound from the swim bladder to the middle ear. Together these fish represent nearly three-quarters of all freshwater species. 1. Skeleton of carp (Order Cypriniformes, Family Cyprinidae). 2. 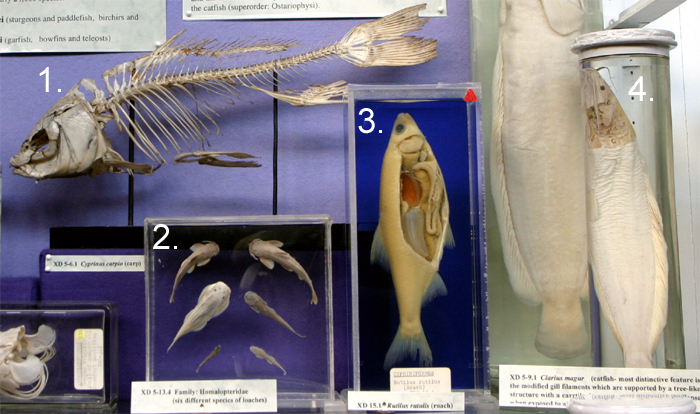 Six different genera of river loaches from S. E. Asia (Order Cypriniformes, Family Balitoridae, synonym Homalopteridae). Balitorids are specially adapted to feed on algae growing on rocks in fast flowing waters. Their mouths are ventral and their pectoral and pelvic fins fused into suckers to hold the fish onto rocks. In certain species, the skull bones are curved together in front of the snout and act as bumpers. 3. Dissection of roach, Rutilus rutilus (Order Cypriniformes, Family Cyprinidae). This preparation shows internal organs including the swimbladder. 4. Dissection of an �air-breathing� catfish, Clarias sp. (Order Siluriformes, Family Clariidae). This preparation shows the modified gill structures supported by a treelike structure and cartilaginous trunk that prevent the gills collapsing when exposed to air.